The Backyard Bird Watcher is the ultimate guide for all who enjoy watching wild birds at their back doors. The Backyard Bird Watcher offers a month-by-month planning and preparation calendar to ensure bird-watching enjoyment, as well as lists of organizations, manufacturers, books, and other items of interest to the backyard bird watcher. Beautifully illustrated with dozens of detailed drawings and more than 200 black-and-white and color photographs, The Backyard Bird Watcher is a must for anyone who wants splendid wild birds to be a rewarding part of his or her everyday life. What is a bird watcher? A person who watches birds? I suspect that most people watch birds, and yet many do not consider themselves bird watchers. The definition of a bird watcher is changing. Thirty years ago, the "typical" bird watcher was exemplified by magazine cartoons as a nattily dressed, elderly person who, from all outward appearances, was eccentric, if not downright odd. That early image of "the little old lady in tennis shoes" gave the sport a stigma which, to this day, makes some people uneasy about admitting that they enjoy watching birds. Today, the typical bird watcher, or "birder" as we call ourselves, is male, white, married, above average in education and income, and is either retired or a young professional according to one recent study. This may be the average bird watcher, but the sport attracts all kinds of people from all walks of life, and their numbers are growing at a dramatic rate. During a recent telephone conversation with Roger Tory Peterson, the dean of bird watching the world over, I asked him to estimate the number of bird watchers in the United States today. "What is your definition of a bird watcher?" he responded. Before I could answer his first question, he went on, "Do you include duck hunters as bird watchers?" We finally settled on the figure of at least twenty million Americans who spend money on bird seed or equipment, or on travel just to see birds. I believe this is a conservative estimate. A recent study conducted by Richard M. DeGraaf and Brian R. Payne of the U.S. Forest Service Research Unit at the University of Massachusetts in Amherst showed that Americans spend at least $500 million a year to enjoy birds. Of this total, $170 million was spent for bird seed; $187 million for photographic equipment and processing; $115 million for binoculars; $15 million for birdhouses and feeders; and $4 million for bird guides and other books. These figures do not include travel expenditures. Another survey showed that bird watchers and photographers alone accounted for 9,900,600 use-days on National Forest lands in a single year. So, bird watching may have been the sport of "little old ladies in tennis shoes" at one time, but "you've come a long way, baby" since those days. Bird watching is probably a billion-dollar-a-year industry and may be the fastest growing family sport in America. Why is it so popular and why is it growing so fast? The answer is simple: The sport of bird watching is easy to get into, inexpensive to maintain, requires little prior knowledge and almost no equipment. Actually, all you need to attract birds to your backyard is a little seed thrown on the ground...then wait for the birds in your neighborhood to find it. But if you really want to attract a variety of interesting and colorful birds on a permanent or at least seasonal basis, there are proven ways of doing it, and that's what this book is all about. Wild birds are everywhere during all seasons, in all habitats. Bird watchers start out by observing the birds they see in their backyards, on their way to work, around their camping areas, etc. Though you certainly don't have to be an expert to enjoy birding, it helps to be able to identify what you see. By being able to recognize the species, you are more likely to learn something about its characteristics and habits. We identify birds by spotting certain key field marks, behavior, song, size or shape. Thanks to Roger Tory Peterson, who in 1934 wrote and illustrated his first A Field Guide to the Birds, we know that every species has its own particular identification signs or marks. Before the Peterson Field Guide, bird watching wasn't as much fun. The descriptions of birds were made by scientists who worked largely from study skins in museums. Instead of saying that a robin was a gray-backed bird with a rusty breast, they described it in the minutest detail, including the "white spots around the eye and the streaked throat." Peterson's new system changed the whole concept of bird watching by giving us a simple and exact method of quick field identifications. During my courtship with my wife, Kit, I taught her how to identify birds. Her experience should give encouragement to anyone starting from zero. Within one year, Kit learned to identify over 100 species from sight and sound. The way she did it was to look at each bird she encountered, often through binoculars, listen to it sing or chip, and then check the illustration of that bird in a field guide and read the description of it. I pointed out to her the salient field marks...white wing bars, red cap, white outer tail feathers, smaller than a robin, larger than a crow. I would impress upon her the habitat in which it was found, how it was acting, the song or alarm note it gave, and the season of the year in which we found it. She is a quick learner, and within three years she was able to identify 300 to 400 birds and was sometimes correcting my errors in identification. Her pinnacle came two years ago when she and Roger Tory Peterson had a serious discussion comparing the differences between a newly hatched coot chick and a newly hatched chick of the European moorhen. More recently, Kit and I were amazed to find a birder making accurate field identifications without binoculars. We were in Cuba, birding with that country's foremost ornithologist, Orlando Garrido. While most of us were looking for the field marks through binoculars, Garrido was watching for characteristic movements such as tail bobbing, wing flitting, nervousness, head movement, stance, movement in flights. I tried to catch him in error, but he was always correct and more rapid than I in identifying the bird. He is the most extraordinary field ornithologist I have known. No matter how you look at it, bird watching is a sport. It is a personal challenge to identify the birds you see, learn their habits and how they differ from other species. The most common game that bird watchers play is the "listing game." Almost all birders, particularly backyard birders, keep records of the species they see in their neighborhood. Kit and I have recorded 142 species in five years seen through our windows and from our property. Using the official checklist published by the Wisconsin Society for Ornithology, we record, each year, the date on which we see the first bird of each species. This gives us a running record of when the first red-winged blackbird appears each spring, the first junco each fall. The dates vary year to year by as much as two weeks, depending on weather conditions. We also note the date each spring when the ice goes out of our lake, which has a direct effect on the waterfowl we see. We mark the date that the lake freezes over each winter as well. One of the highlights of our listing game is the appearance of our loon each spring. I theorize that any lake that can support a loon, even if for only a few days, is a wild lake. Our lake is located only twenty-six miles northwest of a major metropolitan area. Each spring, our loon spends at least a week with us soon after the ice disappears, and by his appearance declares that our little lake is "wild" for another year. I suspect that there are probably several loons that visit our lake, but we can't differentiate because they all look alike. We did have two at one time several springs ago. Last fall we had a loon headed south in its winter plumage, which was decidedly different from its spring garb. Notes like these are all part of our list. There are several other kinds of lists, such as the one-day list, which is a record of all the birds seen or heard on a specific day. Some like to keep a trip list or a list of birds seen during a visit to another backyard bird watcher's home. But the most common list is the one that records all those birds seen or heard over a particular year or each of a series of years, like the one we keep. One backyard birder not only keeps a running list of the birds in her yard but tries to photograph each one as well. She pastes a photographic print on the page of her record book opposite the dates and notes about that particular species. Another backyard birder posts all his records on a large wall chart that is a permanent part of that house's decor. People visiting him can see at a glance the birds he has seen and the dates the sightings were made. It's a great conversation piece. The most dedicated keep a life list -- all those species seen during a lifetime, not just in the backyard, but for North America or for the world. The most radical of those life listers will go to any length to add just one more species to their list. A classic example is the North American champion, Dr. Joseph Taylor of New York. Dr. Taylor had 720 species on his life list when the Ross's gull was sighted in Massachusetts. Dr. Taylor was in Nairobi at the time. Not wanting to miss a rare opportunity to add that species to his North American list, Dr. Taylor flew from Nairobi to Massachusetts, saw the gull and then returned to his African tour. At this writing, Dr. Taylor still leads the life listers with more than 730 North American species. To help listers see more birds, some larger cities have a "birding hot line." It is a telephone number a birder calls to get a taped recording of the current unusual species being seen in the area. The system also enables the caller to give information on an interesting sighting to be added to the tape. Each holiday season, during the two weeks centering around Christmas, the National Audubon Society holds its annual Christmas Bird Counts throughout the world. More than 1,200 approved groups of bird watchers count the numbers of species and the numbers of individuals of each species in a fifteen-mile diameter over one twenty-four-hour period during those two weeks. In the U.S., the current record is 216 species, counted in Freeport, Texas. The record for the world was set in the Canal Zone of Panama, where 344 were recorded. If there is a Christmas bird count in your area and if your backyard falls within the fifteen-mile diameter, offer to help the group by reporting all the species you see on that day in your yard. It is possible that some of the birds you see will not be found anywhere else in the counting area. Reports on all the Christmas Bird Counts are printed in the National Audubon Society's publication, American Birds. Another game bird watchers play is the "listening" game. The challenge is to be able to identify as many species as possible by the songs or call notes they give. There has always been some disagreement among birders as to the validity of a record of a species that is heard but not seen. Personally, I believe that if you hear the bird and are positive of its song, then you are entitled to record it on your own personal list. However, the American Birding Association, the organization that keeps records of the top U.S. life listers, requires that the bird be seen before it can be officially recorded on a life list. Regardless, the ability to identify a species by its song or alarm note is a great accomplishment. No two species make identical sounds except imitators such as the mockingbird and starling. Once you learn the song of a species, identification is much easier and you don't have to spend time searching out the bird among heavy foliage or at the top of a high conifer. Warblers are particularly hard to see. When Kit and I are birding in one of our favorite haunts, Mount Desert Island, Maine, the listening game is the only way to go. Blackburnian and bay-breasted warblers are nearly impossible to see in tall spruce trees, but their lovely songs are easy to recognize. If we had to spot each singing male to be sure of its identification, it would take all the fun out of birding in Maine. So the listening game is important and fun to play as you become more adept as a bird watcher. Some backyard bird watchers record bird songs on tapes, then play them back to get interesting responses, particularly from male birds defending territories in spring and summer. Another valuable scientific effort is the North American Nest Record Card Program of the Laboratory of Ornithology at Cornell University. Volunteers from all over North America record information about birds' nests they find and send a completed record card to the Cornell Laboratory, where it is fed into computer banks on each species. This information leads to valuable data about population trends and the effects of weather and environmental pollution on certain indicator species. For more information, write The North American Nest Card Program, 150 Sapsucker Woods Road, Ithaca, New York 14853. The sport of bird watching often leads to social gatherings. When two backyard bird watchers get together for dinner, cocktails, birthdays, other social events or even business meetings, the conversation inevitably turns to birds. An example of this is our relationship with our good friends, the Tom Rosts, who live in the community of Cedarburg, Wisconsin. Tom is a distinguished wildlife artist, and just outside his studio window is a very active bird feeding station. We see the Rosts about once a month, and a great deal of our visiting time is filled with conversation about the new birds we have seen at each of our homes since our last get-together. Our experience with the Rosts is probably typical of many birders. The American Birding Association and the Bird Populations Institute are national associations to which many birders belong. More scientifically oriented birders and professional ornithologists join the American Ornithologists' Union, the Wilson Ornithological Society, the Cooper Ornithological Society or the Cornell Laboratory of Ornithology. The first of these groups, the AOU, concerns itself with, among other endeavors, the taxonomic aspects of ornithology and maintains the official list of both common and scientific names for birds of North America. The AOU has become better known recently for the numerous changes it has made in bird names. For example, there is no longer a Baltimore oriole. It was lumped with the Bullock's oriole and both are now called the northern oriole. The same is true of the myrtle and Audubon warblers. They are now called the yellow-rumped warbler. The AOU made three changes in the name of our common egret, from American to common to great, in the last decade. These changes and many others are based on well-founded scientific study, but some bird watchers get upset, mostly for sentimental reasons, but also because their life lists shrink every time two species are lumped into one. Most enthusiastic backyard bird watchers sooner or later take birding trips. No research has yet been done on how many miles birders travel each year in pursuit of their sport, but it has to be in the many millions. For example, Kit and I traveled 2,500 miles to Mexico two years ago just to attend, at that time, the world's top-ranked Christmas Bird Count in Catemaco. We were amazed to find that there were fifty-one other birders there who had also traveled from the United States and Canada to this remote jungle. The attraction was to see nearly 300 different species in a Christmas Bird Count. We have discovered that one of the pleasures of our travels is our portable bird feeding operation. We carry with us some of our backyard supplies, which usually include bird seed, anytime we go afield. When we are headed for the Southwest, we also take sugar water and hummingbird feeders. When we stop to camp or for a picnic lunch, the first chore is to put out bird seed or table scraps on a fiat rock nearby. Almost always we attract local populations of birds and mammals. At busy tourist stops, particularly in the West, we often find an eager flock of jays and squirrels ready for a handout. While producing Roger Tory Peterson's Dozen Birding Hot Spots, we fed a pair of mallards at our Bear River, Utah, camp site each evening around suppertime. They ate wild bird seed mixture out of a margarine cup. A few months earlier in Madera Canyon, Arizona, we fed a dozen different species of birds at our camp site, including four kinds of hummingbirds attracted to sugar water. We find that the same principles that apply to the backyard feeding station at home apply to the portable feeding station on the road. If we select the right kind of habitat for our stops, we have a good chance of having the companionship of local birds for as long as we are there. We have always known that birding is best early in the morning, but we didn't realize how dramatically better it was during early hours until we read the records in the accompanying table, kept by bird bander Wallace MacBriar, who captures birds with a mist net and bands them at the Schlitz Audubon Center in Milwaukee. You can see by this table that after 10:00 A.M. the birds per net-hour drop off dramatically even though the opportunity for capture (mist net-hours) remains relatively high. This indicates that birds are less active during the midday and early afternoon. Note that the number of birds captured between 9 and 10 A.M. is the highest, yet analysis of the opportunity for capture indicates that the period is much less productive than the 6-7 A.M. or the 7-8 A. M. periods. It has only been one hundred years or so since John James Audubon, Henry David Thoreau and, more recently, John Burroughs, wrote about the birds they saw and fed. But the person who may have invented the sport of backyard bird watching in this country was Wells B. Cook, who in 1880 organized people to report on the movements of birds to the U.S. Department of Agriculture. He may have been the first person to challenge Americans to really watch birds. In 1888 Cook published the accumulated information in a report on bird migrations. Soon afterward, in 1895, Frank M. Chapman wrote A Handbook of Birds of Eastern North America. It was a major accomplishment for its time, but compared to modern field guides, it left much to be desired. The early 1900s produced a host of ornithologists including Edward Howe Forbush, editor of the Birds of Massachusetts, Ludlow Griscom and Arthur Allen. The period also produced a number of great American bird artists such as Louis Agassiz Fuertes, Francis Lee Jaques, Allen Brooks, Edmund Sawyer, Bruce Horsfall and, later, Roger Tory Peterson. But the greatest achievement to date in the field of bird watching is Peterson's A Field Guide to the Birds, published in 1934. That one book made bird watching what it is today. It simplified the sport to the point where anyone could learn to enjoy birds. It and its many revisions have remained the bible to this day, and it has made Peterson the high priest of the bird world. A product of Roger Tory Peterson's "boom in birding," I have watched the sport grow from a handful of dedicated, sometimes abused, people who met quietly in small auditoriums or homes to the national preoccupation that birding has become today. It seems that everyone is watching birds. I know governors, telephone linemen, secretaries, college students, policemen, radio repairmen and space engineers who are all backyard bird watchers. We now find commercial advertising aimed at birders on cereal boxes, in national magazines, on television and in huge department stores. According to Better Homes and Gardens, backyard bird feeding has become a kind of winter replacement for gardening. In the summer, backyard birds are, indeed, an integral part of colorful gardens all over America. Recent research by the U.S. Forest Service at the University of Massachusetts in Amherst has given us simple steps that will almost assure the attraction of birds to just about any backyard, and thousands of families are finding that they really work (see chapter 2). Looking into the crystal ball, I would guess that we have just seen the tip of the iceberg. My instincts say that in another ten years, virtually half the households in America will be feeding birds and that the present billion-dollar-a-year industry will double. The following pages of this book are designed to give you the knowledge to create your own successful backyard bird habitat, which should lead to more happiness and fulfillment in your life. * A Field Guide -- There are a number of good field guides to the birds of North America available in most book stores. The two I like best are A Field Guide to the Birds, by Roger Tory Peterson, published by Houghton Mifflin (previously mentioned), and Birds of North America, by Robbins, Bruun and Zim, with illustrations by Arthur Singer, published by Golden Press. Both are excellent for beginners as well as experts. Both have color illustrations of each species and descriptive text plus information about range, habitat and other characteristics. They are compact for carrying in the field, and are available in paperback editions. The Peterson book is for eastern species only. His A Field Guide to Western Birds covers the balance of the United States and Canada. The newest guide, The Audubon Society Field Guide to North American Birds (two volumes), is arranged by bird colors rather than by bird families, which might make identifications easier for beginners but is more difficult for those trained on Peterson guides. * Binoculars -- Of the basic equipment needed for total enjoyment of bird watching, a good pair of binoculars is probably the most important. I say "good," because there are many on the market and some are so cheaply manufactured that use of them will actually reduce your enjoyment of birding. Costs run from $50 to $500 a pair. * How to Buy Binoculars -- Here are some points to consider when buying a pair of binoculars. Exit pupil test. Hold the binoculars up to the light at about fifteen inches from your eyes. Notice the light coming in through the two eye pieces. If the circle of light comes through in a perfect circular shape, that generally indicates better-grade optics. If the light comes through in a polygon shape, that means you will probably have difficulty in resolving the fine details essential in birding. Central focus. The style that has one wheel in the middle for focusing both eyes at the same time or the more modern instant-focus lever is called a central focus binocular and achieves fast, sharp focus needed for birding. Central focus models also have a right eye adjustment for eye strength correction, but once that is adjusted for an individual's eye balance, the central wheel adjustment is all that is needed to focus at any distance. Adjustable cups. Particularly important to people who must wear glasses are adjustable eye cups that screw down (or fold down if made of rubber) to allow your eyeglasses and thus your eyes to get close to the binocular lens. Adjustable eye cups increase the field of vision for wearers of eyeglasses by about 50 percent. Strength of bridge. The stronger the bridge connecting the two lenses, the fewer problems with alignment. Heavy construction. The heavier the binocular hinge, the better the assurance of alignment is what the industry tells us, but for bird watchers, weight is a consideration. Some manufacturers do make lighter-weight models of good quality. Lens coating. Fully coated lenses help limit internal reflection and loss of transmitted light. Front ultraviolet coatings act as haze filters. Resolution. Select a distant point with fine detail and compare the models you are considering. For the bird watcher, it is important to see the finest details. Our favorite birding binocular is the Bushnell Custom 7 power x 35mm. This unit is well-built, lightweight, has a wide field of vision, a near-focus of fourteen feet, good resolution, and has screw-down nylon eye cups. Kit and I each have a pair, which are usually sitting on our desks when we are not afield. Kit's office is on the west side of the house, mine on the north. We each have our own "bird window," where binoculars are useful on any given day. We use another Bushnell binocular for business trips where bird watching may or may not be possible. It is the ultra-lightweight Custom Compact 7 x 26. It is small enough to fit in your pocket, briefcase, or palm of the hand. Though it does not transmit as much light as the Bushnell Custom for serious birding, it is an excellent compromise when packing the larger model is a problem. * Binoculars and the Elements -- There are some things to keep in mind when you take your binoculars outside, particularly in the winter. In very cold weather, don't keep your binoculars too close to your warm body. The contrast of heat and cold causes moisture to condense and fog the lenses. If you want to keep your binoculars from dangling as you climb a cliff or lean over a mountain stream, put one arm through the strap and carry them across one shoulder and under the other arm. Most binoculars come equipped with long neck straps. Either cut off a few inches or tie a knot in the strap to allow the binoculars to rest on your chest, where they will not sway or bounce as you walk. For maximum definition of details when outdoors, wear a hat with a bill on the front to shade out the light. When eyes are not shielded, light from the sky causes the pupils to contract, creating a "washed" effect that makes the bird appear dim. When light is shielded, the pupil remains large and all the light coming through the binoculars is utilized. When you are caught in a rain or are birding near saltwater, be sure to wipe your glasses with a damp cloth. Clean the lenses only with lens tissue or a clean linen handkerchief. Blow the grit from the lenses before wiping. I have discovered that backyard bird watchers sometimes have a problem when using binoculars to see a bird through a kitchen window. If you find that you cannot focus sharply, the problem may be with the glass in the window, not your binoculars. Old or poor quality window glass has imperfections that are magnified through binoculars and camera lenses, causing distortions of your subject. Plate glass, however, is excellent for this purpose, and if your main birding window is not of good quality glass, you might want to replace it. Our glass walls are not only plate glass, but are also Thermopane (two layers), yet we have no problem seeing birds up close through binoculars or camera lenses. We even have success at rather severe angles. Some birders prefer a spotting scope to binoculars. They like to set up their powerful scopes on a tripod for excellent viewing of birds far beyond the good sighting range of most binoculars. The spotting scope has a definite place in the equipment of the backyard bird watcher. Some of our friends leave their scopes set up in their houses focused on the most popular feeders. When there is some unusual activity or a rare bird appears, they are ready. Not a bad idea. Though we prefer binoculars, we did this last winter when a pair of screech owls moved into our wood duck box. Every morning and evening, the screech owls watched us watch them through a spotting scope. * Shoes -- If the backyard bird watcher does all his viewing from inside, there is no need for special footwear. However, most birders we know are inclined to "beat the brush," and shoes are an important consideration for those of us who look for birds in wet, rough and brushy terrain. Tennis shoes are not good for this. Sturdy, leather hiking shoes or boots, costing $30 to $50, are the best. Tough but comfortable footwear will allow you to charge right into thickets without concern for thorns, sharp rocks or nettles. Kit and I both wear Vasque Explorer boots, an ankle-high, light-weight, rugged hiking shoe with a Vibram sole for good traction and wear. There are many hiking shoes or boots on the market, but most tend to be too heavy for bird watching activities. The Vasque Explorer boots seem to satisfy our needs, and they are very comfortable, fashionable footwear. * Backpacks and field guide pouches -- Though certainly not essential, we have found that a simple backpack is a help on most bird walks. We usually carry in it a camera, insect repellent, field guides and sometimes our raincoats. This leaves our hands free to use binoculars or cameras. Artist friend Ned Smith told us about another way to carry field guides. British army engineer's survey packs, available in army surplus stores, are shaped perfectly for carrying two field guides over the shoulder or on a belt. * Squeakers -- For a nominal sum, an Audubon Bird Call can be purchased through mail order houses. This little device makes a high-pitched sound that resembles the call of a baby bird and will attract the attention of many species. Some birders "squeak in" birds by merely kissing the back of their hand or the side of the index finger. Regardless of how the noise is made, it is an effective way to get birds in closer for more positive identification. * Camera -- The backyard bird watcher has excellent opportunities to produce exciting bird photographs. That subject is treated in detail in chapter 8. John Strohm Editor, National/International Wildlife At last, a book that, in simple terms, tells people how they can have the greatest show on earth in their own backyard. 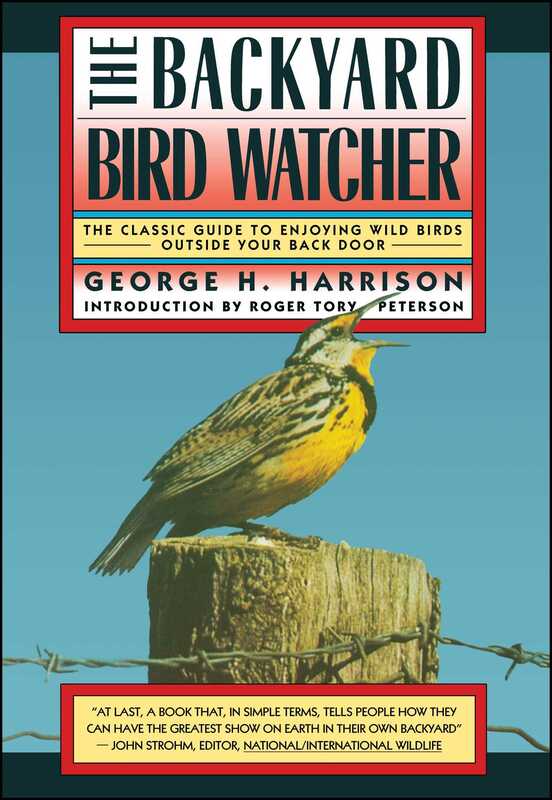 James A. Tucker Secretary of the American Birding Association, Inc. [The Backyard Bird Watcher] is comprehensive, concise, and emphasizes a dimension of birding that has been largely over-looked in print. It is a unique and delightful approach to birding.